As promised, I am here with my very first all-encompassing quarterly goals post. If you haven’t read my last post, let me quickly bring you up to speed as to what these quarterly goals are all about. I picked up this goal setting/tracking system from a writer I follow on YouTube, who sets 10-20 goals for herself every quarter, and the rules are that if she has to ‘win’ the quarter, she needs to complete 75% or more of these goals. And these goals span across all areas of her life. This kind of holistic approach to goal setting made sense to me, because then these goals will be able to effectively represent all my priorities, unlike last year, where I set quarterly goals only for tracking my health & fitness, which turned out to be a very narrow focus to keep me motivated. And the reason I chose the quarterly time-frame over the monthly or the yearly, is because the former is too short a time-span for me to get anything done, and the latter just triggers my lazy, procrastinating self into high gear. 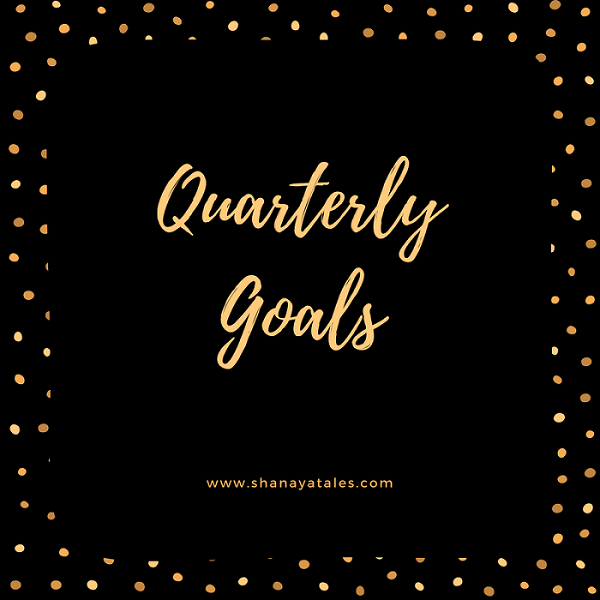 Now before getting into the actual goals, speaking specifically of the first quarter of the year, I must admit that I am a little intimidated to set goals for this particular time frame, because there is a lot going on right now. And I know, I know what you are thinking…we all feel like there is a lot going on all the time. But trust me, this is different. For one, my younger sister is getting married in March, and as it happens, in the very same month, my son is turning 5. Now both these events will be celebrated in India, which of-course means I am headed there in March for about 2-3 weeks. But it’s not just about those weeks in India (which in itself, I must say, is a huge distraction for my ambitious goals), it’s about all the prep and planning that precedes these events too. A routine India trip (if such a thing exists) involves a lot of careful planning & coordination, but now with two events to plan for, on top of everything else, just thinking about how much work is staring at my face makes me want to take a long nap. Right now. And then these goals. God help me! Sort all personal photos & videos – I am starting with this goal, because if I fail all my other goals, but complete this one, I will be ecstatic, because this has been on my To-Do list for 5 years. Yes you read that right, five years. Essentially this involves going through truckloads of digital photos, and sorting them out, to make organized digital files. Sounds simple enough, right? Apparently it isn’t that simple. Because why else would I postpone this for five years? Why? Make a video collage for my sister’s wedding & my son’s birthday – Now this is one ambitious goal, because firstly it assumes that I have actually sorted the pics and accomplished goal #1, but more importantly, it also assumes that I have finally figured out how to edit a video in i Movie or Windows Media Player or whatever else people use. Nonetheless… aim for the sky, right? Start Chatty Blogs – This is one series I promised a long time back, but never got around to actually starting it. I hope to start it towards the end of Jan, but if not, at-least in February, because March looks unlikely for me to start anything, what with the India trip and everything. Though I know that if I start this in Feb, I will continue this in March, and going forward. Set Up Yoast – It’s sad that this has to be an actual goal here. It’s a simple task. Which I have been procrastinating for the past 5 months. So, here it is – an official goal. Start the Food Blog – Here is a fun story for you guys, or at-least the condensed version of it, as the full story would turn into a full fledged blog post, which I am not sure you guys are interested in. But here is the summary – when I first thought of blogging, I wanted to start a food blog. I even registered one. Almost 3 years back. Even before I started (or even thought of) Shanaya Tales. But I have been putting off actually starting the food blog, because of wanting to make it perfect. Now that I know better, that aiming for perfection is pointless, I really want to start it anyway – in all its imperfect glory. But like I said, I have been putting this off for 3 years. So, pray for me that I am finally able to take the plunge this quarter. Buddy Read (and review)- Jane Eyre – Okay, the reading part of the goal I know I will achieve, because I am really looking forward to both things – reading the actual book, and buddy-reading it with Bookish Muggle. The review is what I want to stay on top of, and get it out as soon as the buddy read is done. Write (and publish) the beginner to audio-books series – This is another series I have been procrastinating for about 20 years, or at-least it feels like it’s been that long. And this is another series of posts I truly want to write. Hence the goal. Lose 9 pounds to reach my short term weight goal – This one I am cautiously optimistic about. Because as of today- I have lost 5 pounds in the last month, thanks to the system I mentioned here, but who knows when the plateau hits. And I know that 5 pounds in a month will not seem like a lot to many of you, but I haven’t lost even 500 grams from many many months, so it’s an achievement for me, albeit a small one. Elliptical 20-30 minutes – 5 days a week – The plan is to start with 20 for first week (which is done), and work towards 30 minutes. Fit Bit 5000 steps – 5 days a week – This is a pretty self-explanatory goal. I would have liked to set a more ambitious goal of like 10,000 steps a day or some such, and I probably would have set just such a goal, if I hadn’t used Fitbit for a month, and actually tracked my average number of steps, which is 2500-4000 steps a day. So, I settle for 5000. That’s all from my end folks. How does your upcoming quarter look like? Do you guys have written goals too? What is the one thing you would like to accomplish in the first quarter of the year? Do share. We can cheer each other on. Good luck for this quarter. I am sure you will achieve all these goals. This year I am pretty much not setting any goals as I am bad at completing them 🙁 I might get inspired from you and do this for next year. I like the idea of quarterly goals. I think I will try it out this year! Really wonderful to set some goals and try to attain them. I have started something of this sort too, in fact I have made it monthly goals. However! I have only a blogging goal, I shall follow your other goals also! I love your ‘goal’ posts. They always inspire me to make some of my own, though I’m not too good at getting through them. I love the ones you’ve set for yourself. Good luck with them. Looking forward to your food blog. Oh and there is the photo sort too..sigh. Can I take this forward? I loved this idea of having quarterly goals and practical approach of execution. I think this way I can achieve something in real. Hi Upasna..sorry for the delay in approving your comment. It had gone in spam, and I only found it now to retrieve it. I am glad that you found this helpful, and I would love to hear how this approach works for you. Its second month of the Quarter and still have time to set my goals. Will let you know about it. Thanks. I liked this idea of short term goals, Shan. I know I need to make those goals as far as my blogging and art goes. Last year, I was so much more regular with my art. However, this year, the reading bug has bitten me big time and I am (most of the time) buried in my books! I am loving it..reading all those awesome tomes, but it’s taking away from my art and my writing! Guess, I will have to become serious and set goals, quarterly goals and work on them. I love the idea of quarterly goals and winning the quarter. Pretty cool. Agree, quarterly goals are easy to track. I love chatty posts, I mean reading as well as writing. They are so much fun and give a glimpse of your life too. So delighted to read this in the morning, Shanaya. Quarterly goals sound like the perfect idea. I’m wondering why couldn’t I think of this before?!? Sorting digital photos is a task, and is on my to-do list for I don’t even know how many years? I’ve lost the count! Wow you are so organized… That’s a lot of planning and sorting out priorities. I wish you good luck… And keep us posted. At least I will drive inspiration from your successful completion of goals ? This! This is so organized that just looking at it makes you feel like accomplishing them. No Bookish Bingo this year? Thank you so much for your support and encouragement, Sreesha. It truly means a lot. As far as Bookish Bingo goes – not this year, I still have to complete some categories from last year, which is what I will focus on, in addition to the reading goals I have set for this year. But I plan on another round in 2018. It was way too fun to be just a one year wonder. That is pretty comprehensive and l wish you all the luck in achieving it. Losing 5 pounds is pretty good and you seem to be doing well. Pat yourself on the back for achieving that. Do let me know if your trip includes Bangalore. Would love to catch up. Oh I would love to catch up too. As of now, Bangalore isn’t on the agenda, but I am trying to make it work. Will keep you posted.